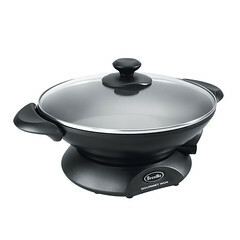 The Breville Electric Wok — The only electric wok that works just like a traditional iron wok on a gas range. Blazing 425°F (218°C) sear-ability melded with butterfly element even heat distribution brings real Asian flare to the at-home menu. 15 settings for all kinds of meals including pasta, soups, or eggs. Dishwasher-safe, durable Quantanium nonstick finish allows less oil use for leaner cooking. 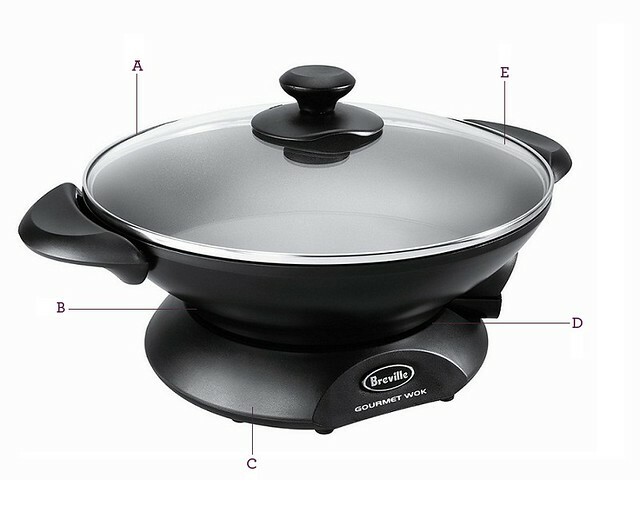 A. Quantanium Scratch Resistant Non-Stick Bowl. B. High Wall Butterfly Element. C. Quick Release Removable Base. D. Sealed Element. E. Cook 'n' Look Lid. Not Shown Breville Assist™ Plug.